Poet, painter and printmaker British, born in London on November 28, 1757, and died in the British capital on August 21, 1827. By its radical evolution since the neoclassical aesthetic postulates to new romantic current; by his poetry original, prophetic and visionary; and by the prints with which he/she illustrated the mystical power of his poems, it is considered to be one of the most significant figures in British culture and art. Born into a modest family (his father was a humble shopkeeper who traded with haberdashery products), did not have access to a careful education, so his academic training is limited, basically, to the product of its numerous readings. This self-taught spirit allowed him to imbue at will in the legacy of the Theosophist and German mystic Jakob Böhme (1575-1624), whose reflection of visions and experiences iluminativas would have decisive influence in life and in the work of the avid reader who was then William Blake. He/She also ventured in the knowledge of scientific mysticism spread by Emanuel Swedenborg (1688-1772), who was believed to be enlightened by God to offer a new interpretation of Scripture, interpretation that would end up shaping his foundation of the new Jerusalem church. 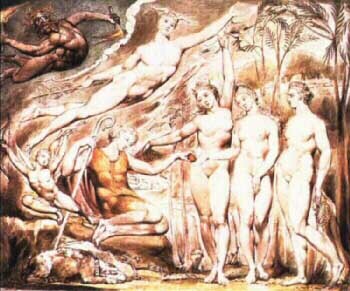 At the time that progressed by this visionary runway, William Blake began to cultivate his innate passion for painting. After enrolling in a school of engraving, at the age of fourteen he/she began to work as an apprentice, with the famous engraver James Basire, and soon joined the Royal Academy. But, once there, immediately rebelled against the teachings of its director, sir Joshua Reynolds, a furious defender of the aesthetic postulates of neoclassicism. This radical confrontation with the currents that were in vogue in his time did not prevent him, however, fruitful relationships with some illustrious scholars (such as the sculptor John Flaxman and the painter and writer Henry Fuseli), whose works also greatly influenced the artistic training of Blake stage. In addition to these influences, at its learning, it is easy to detect the admiration that professed by the Hellenic age, and by some of the great masters of the Renaissance such as Rafael, Miguel Ángel and Durero. So things at the beginning of the Decade of the 1980s opened an own imprint which began to print his first poems illustrated by himself, works which, although not they won him a huge popularity in its time, today enjoy high esteem among the followers of the poet. However, and despite the invaluable help that in the business his wife, printing provide you failed and William Blake was forced to remain working as engraver and Illustrator for hire or reward. Initiated in the cultivation of poetry since the age of twelve, in 1783 he/she took to light his first printed poems, a collection of juvenile verses which, under the title of Poetical Sketches (poetic sketches), accused the immaturity of any early work, although they also anticipated some very significant features of that style that, over time, would coin as their own. This volume did not enjoy widespread, and William Blake remained best known for his work as an Illustrator. Six years later he/she gave to press another collection of poems, Songs of Innocence (songs of innocence, 1789), composed some poetic pieces of extraordinary quality. It's poems of great freshness and outstanding eloquence, born of a Rapture of mystical effusion that tries to directly reach the soul of the reader. Subsequently, he/she opposed this work his Songs of Experience (songs of experience, 1794), in which was much more realistic when it comes to rely on the little opportunity to reach human perfection, although he/she recovered numerous stylistic and thematic features of the previous poems. Referred to as if it were a unitary work, both volumes have great analogies, and contribute to give a picture of the human soul in which innocence and experience appear as two opposing moods: "The Lamb" (title of a composition of the first poetry book) represents the innocence of childhood, when the soul, unrelated to corruption resulting from experience (represented(, in the second volume, by the poem entitled "El Tigre (the Tiger"), is shown in all its purity, undefiled adulthood. Later, Blake was devoted to working on this fundamental thesis of his lyrical thought, which was finally developed in the formulation of the idea that true innocence cannot be taken without having also met the experience, which, to return to its original state of innocence, should be transformed by the creative capacity of the imagination. These songs appeared illustrated - as already indicated above - by the engravings of William Blake himself, who demanded the reader of his verse and - at the same time - contemplator of his graphic work a capacity of reception extremely imaginative and very open. The richness and variety of the dark symbolism which reflected in his artwork makes it difficult to find his relationship with poems they accompany, especially when that prophetic and visionary spirit that was both in his literary work and his artistic output is not shared with the author. The techniques used for the printing of these engravings, were also enormously original to the point that, today, still not is have failed to identify with certainty the procedures used by Blake. In general, scholars of his artistic work are inclined to accept that the poet first wrote the text, and subsequently performed on a copper plate the drawings which accompany each poem. Using a substance impervious to acid, I got the strokes to be embossed on the plate; then I painted them with colored inks, stamping the engraving on paper, and finally touched the result with one hand in watercolor. This technique was known as illuminated printing. On the stylistic approach of his plastic work, it should be noted the emphatic rejection of the neoclassical postulates, since William Blake always called by the predominance of the imagination on the forces and rational knowledge. Convinced that creative breath should despise the mere observation of natural forms to train in the reproduction of the Interior visions, he/she rejected the prevailing academic turned his eyes to the observable forms in the statuary of the medieval graves (who had studied and copied during its stage of apprentice), and also carefully noticed the contributions of the later Mannerism. So he/she got a line based on rhythmic repetition which, while they diverge radically from the neoclassical aesthetics, accusing notable influences of the aforementioned Miguel Ángel (for instance, in the exaggerated pronunciation of the foreshortenings and the extreme representation of musculature). So is apparent in one of his best-known engravings, "The ancient of days", which leads his poem entitled "Europe, a prophecy" (1794). This rejection of the legacy of the 18th century Converts to William Blake in one of the most emblematic pre-romantic, both as a poet and in his role as artist. For others, and specifically according to the subject of his painting, should highlight its fixation on religious affairs (thus, e.g., in illustrations for the works of John Milton, whose poetry valued above any other sample of all-time English lyric, while its excessive Puritanism it repugnant to him). This religious theme is also present in the etchings that illustrated the journey of the Pilgrim, John Bunyan, and that devoted to the illustration of the Bible (among which stand out twenty-one prints on the book of Job). In addition, approached topics pagan when it comes to illustrate the edition of the poems of Thomas Gray, and made no less than five hundred and thirty-seven watercolors to decorate the night Edward Young's Ideas (though, all of them, were only published forty-three). The judgment of Paris (oil on canvas, 1817). British Museum (London). Meanwhile, William Blake does not neglect his brilliant literary production. From 1789 was writing his so-called "prophetic books", a large collection of extensive poems that always underlies a fixed idea: truth only emanates from the prophetic vision. Throughout these poems, Blake was creating a strange and very rich individual mythology which, through various symbolic characters born from his fertile imagination, all their social concerns had place (thus, for instance, Urizen symbolized the repressive morality, and Orc became the archetypal paradigm of rebellion). Determined to break with previous ideas and formal moulds in which it is expressed, Blake was a radical nonconformist that led him to write: "I must create a system or remain enslaved by others". And thus, from its own system, reached to the most diverse thematic aspects, as well you can deduce from the mere enunciation of some of the titles of poems belonging to these "prophetic books": "The French Revolution" (1791), "America, a prophecy '' (1793),"Visions of the daughters of Albion"(1793, where presented as release sexual gratification to the conformist moral), or "Europe, a prophecy" (1794, where it showed its firm denunciation of the prevailing social and political tyranny in all enlightened Governments of the 18th century). In the book of Urizen (1794) he/she wrote, on the other hand, the denunciation of religious tyranny, and in the mental traveller (1803) tackled the thorny issue of the exploitation of the sexes. In addition, among these "prophetic books" a work is located in prose, entitled the marriage of heaven and hell (1790-1793), where William Blake exposes his original theory that "without contraries there is no progress"; This work includes "Proverbs of hell", a collection of statements made, sometimes, from a perspective so poetic - and radical - like this: "the Tigers of wrath are wiser than the horses of instruction". In addition to these major works, William Blake published other titles as an island in the Moon (1784), one acid and entertaining satire on their first years of life, or the book of Thel (1789), where he/she developed his own concept of innocence, which does not derive precisely from the sexual ignorance. Also released a collection of his Epistles, and an interesting notebook, with graphic notes and some short poems written between 1793 and 1818. This notebook is known with the name of manuscript Rossetti, since in 1847 was acquired by the great pre-Raphaelite poet Dante Gabriel Rossetti, who became one of the top supporters of literary and plastic of Blake. In the last year of the 18th century, the poet and painter left the London capital (which had spent all his life) to settle in the coastal town of Felpham, where he/she remained for three years. It was then devoted to his role as creator, sponsored by the poet and English biographer William Hayly, and focused on their spiritual experience to go back, step by step, more and more visionary and dark. It illustrated the aforementioned book of Job, the Divine Comedy (work that left unfinished) and the work of Milton (1804-1808), and published Vala or the four Zoas (a series of poems about the human soul, written in 1797 and rewritten at the beginning of the 19th century) and Jerusalem (1804-1820). More and more away from the arguments and traditional metric forms, he/she cultivated here free verse and reached high levels of rhetorical complexity requiring a great complicity with the reader. However, it did not stop abound in these last works on the thesis that it had always supported by means of which claimed a kind of innocence, far superior to the known up to then, that was born from the triumph of the spirit over the dogmas of the reason. Already at that time he/she had returned to his native London, plunged into an old age that is aggravated by poverty. In the last years of his life he/she had the fortune of a group of young artists and intellectuals, fervent admirers of his work, socorrieran le economically. When he/she died, on August 12, 1827, had left behind him a fertile poetic legacy which, with the passage of the years, had powerfully influence some creators as notable as Swinburne, Yeats and Emily Dickinson.